Acrylic gouache, wood, black gesso, etc. Mizuma Art Gallery is pleased to present “Kunitsukami,” an exhibition by TENMYOUYA Hisashi beginning on Wednesday, 27th February 2019. 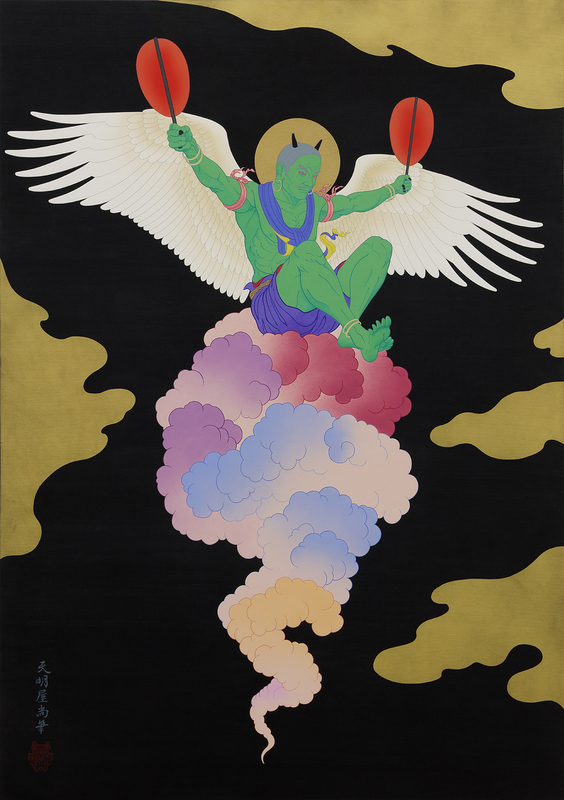 Up until now, TENMYOUYA Hisashi has focused around the lineage of Japanese festive aesthetics, delivering works inspired by basara daimyou of Sengoku period, kabukimono from the Edo period, to the spirit of present day street culture. And what Tenmyouya chose for the motif this time is Kunitsukami (Japanese native deities). Kunitsukami, unlike the heavenly gods that descend from Takamagahara or “The Plain of High Heaven,” are untamed gods born from Ashihara no Nakatsukuni: “The country of Japan,” indigenous to the land since the ancient time. 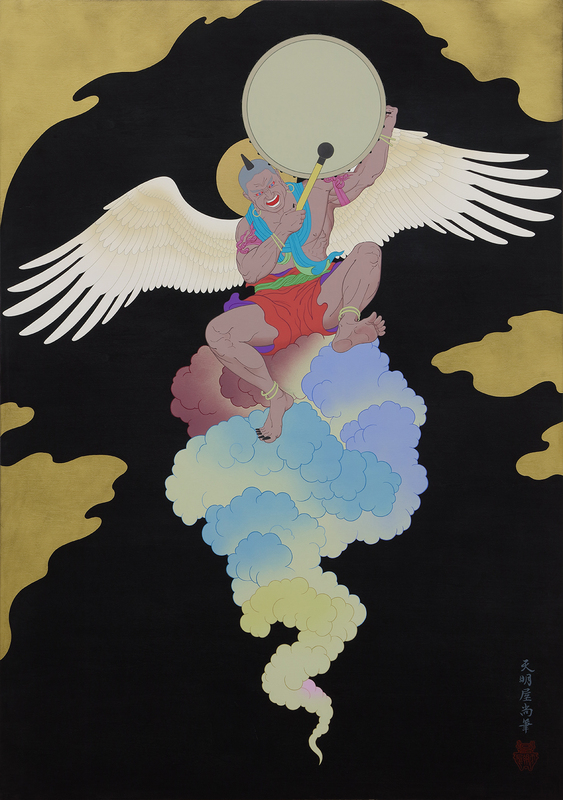 Having been two years since his last solo show, this exhibition will unveil Tenmyouya’s imagination of eight gods: Wind God, Thunder God, Snow God, Rain God, Rainbow God, Ocean God, Mountain God, and Fire God. Each deity riding on either a divine beast or a flying cloud, makes an appearance on earth, and transcends principles of the universe. They are spiritual and invisible beings, hence depicted as an ogre. At the far end of the gallery, stands a sculptural piece inspired by Goshintai or Shinto Shrine’s worshipping objects. By hanging the eight paintings that takes motif from the ancient gods as well as placing the Goshintai, it evokes an air of divinity alluding to traditional Japanese Shinto and Buddhism. Usually, a white cubed-room displaying works of fine art, the gallery is instead turned into an abstract space as it pays homage to Shinto and Buddhism, making this exhibition non site-specific. In the Japanese tradition, before the influx of Western fine arts, existed a custom to only hang Buddhist images from the Heian period, or Shoki illustrations of gods meant to ward off evil made during the Edo period, and the act to enshrine a god or to hang illustrations were all one and the same. In the present time, there exists a separation between religious work and fine art, and metaphorical “god killing” is transpiring, where once decorated imagery of gods in the household is being replaced by aesthetic pieces of fine art. But in truth, are we in admiration for fine art today, as much as people used to be in faith for gods and its artwork? This work speculates on the value of gods and fine arts, the differences in the artistic outlook between Western and Eastern spheres, criticism on civilization and careful attention to animism. We eagerly invite you to an exhibition prevalent to Tenmyouya’s taste with its gala and cheerful style, that brings a sense of immense scale.